Kimberly From Florida, USA asked for a Dog Food Review. Thank you Kimberly, we would be glad to do a review. Kimberly, here is what we found. By the way, if you have a dog food you would like us to review, please ask. But, in the meantime, check out this review and see if this food is right for your small dog puppy. This product is low cost: Cost about $22USD for 16.5 pound bag. This product is easily available all over the USA and online throughout the world. We give this product an F or a score of 66 on a scale of 1 to 100 and Small Dog Place cannot recommend this food. Here are the Dog Food Review results or Purina® Puppy Chow® Brand Puppy Food Healthy Morsels. We started with a score of 100% for Purina Puppy Chow Brand Puppy Food, Healthy Morsels. Out of 100, 37 points were lost due to poor or inadequate nutrition including the addition of some questionable ingredients. Three points were added back to give this food an overall score of 66. After examining the ingredients list, it became apparent that this food does not meet the needs of a growing puppy. In examining the ingredients on a dog food label, you should pay particular attention to the first five ingredients listed. Each ingredient is listed in descending order with the first ingredient occurring in the most quantity. This food lists the first five ingredients as: Whole grain corn, corn gluten meal, chicken by-product meal, whole grain wheat, animal fat preserved with mixed-tocopherols (form of Vitamin E). What this is saying is that the food is primarily made up of corn and wheat, animal fat and chicken by-product meal. If you read my dog food label page, you will know that by product meal can be any part of the animal excluding hair, horns, hoofs, hide, manure or intestinal content. In this case we can be assured that the product does not contain feathers, feet or beaks, but we do not know what it does contain. A product that contains meat and bone meal also raises a red flag. This is an anonymous meat so we do not know what type of animal is providing this ingredient.This is listed as ingredient number 8. The next ingredient is beef but at the ninth position, it is doubtful that the product contains much beef. A quick look on the Purina Website, proves insightful. If it were a beefy food, beef would be listed first or second. 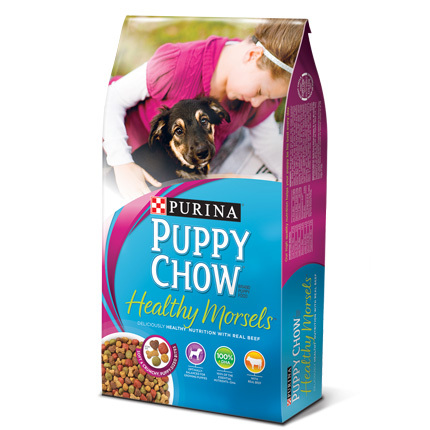 If you go to the site and read the advertisement, you are likely to believe that you are providing a high quality puppy food by feed Purina Puppy Chow Brand Puppy Food Healthy Morsels. Sadly, This is not what we found. While the Guaranteed Analysis is adequate for Puppy Development, the ingredients are inadequate and could pose future problems. Most of the protein is provided in the form of grains (corn, wheat, soy). These foods are often the cause of canine allergies, especially skin problems. Corn is the predominate ingredient in this product. The problem with corn is that it is hard to digest and does not provide adequate nutrition. Therefore, when a puppy eats this food, most of the food passes straight through his digestive tract. Corn and other grains have been eaten by dogs for a very long time, but they are not part of the ancestral diet. Meat is preferred to grains when providing a good diet for dogs. Soy and soy products add to the protein you see in the Guaranteed Analysis, but is not a good source of protein in dogs. Many dogs are allergic to soy causing an assortment of problems when this ingredient is so predominately present in the food. In this case, soy is listed as the 7th ingredient. Beef is the only meat identified and it falls in the ninth place meaning that the amount of actual beef in the product is very small. If you were offered a dish of corn, a slice of bread with a pat of animal fat, accompanied by a teaspoon or less of meat, and served to you several times a day, day in and day out, would you feel satisfied? That is what Purina Puppy Chow Brand Puppy Food Healthy Morsels™ is giving to your dog. The food obviously must smell good to the dog who eats it eagerly. It is hardy and will fill the dog up, but what he or she is getting from their food is lacking. Even the colors look attractive to humans, but dog's don't look at the color of their food. The only good news about the food is the price and the fact that it is easy to obtain usually at a local source. If you are feeding this product to your puppy, we highly encourage you to find a different product that will contribute to your puppy’s overall nutritional needs and well-being. Even supplementing with high quality protein sources and a puppy mineral/vitamin supplement may not be the best advice as there are things in the food such as the artificial colorants that can be harmful. Do you Have a Food that Needs a Dog Food Review? Do you have a food that you would like us to review for your small dog or puppy? Do you have comments about this review? We’d love to hear from you. Use the form below and please provide as much information as you can including your dog’s breed, age, and why you choose the food. The analysis provided here on Purina® Puppy Chow® Brand Puppy Food Healthy Morsels™ and on other dog food review pages represent the opinions of the author. We must rely on the information obtained by the dog food manufacture on their website if we are unable to obtain the actual product.